The cost of education has gone up considerably in the past twenty years or so. This conclusion is borne out by price inflation data collected by the U.S. government. According to the Bureau of Labor Statistics, which collects Consumer Price Index (CPI) data for college tuition, tuition back in 2000 was just 40.5% of what tuition is now in 2017. The average inflation rate for tuition during this period was 5.46% per year. In other words, if you paid $20,000 in tuition back in the year 2000, you'd now have to pay $49,384.94 for an equivalent purchase! Despite the huge difference in numbers, price inflation in the education sector is lower than ever. 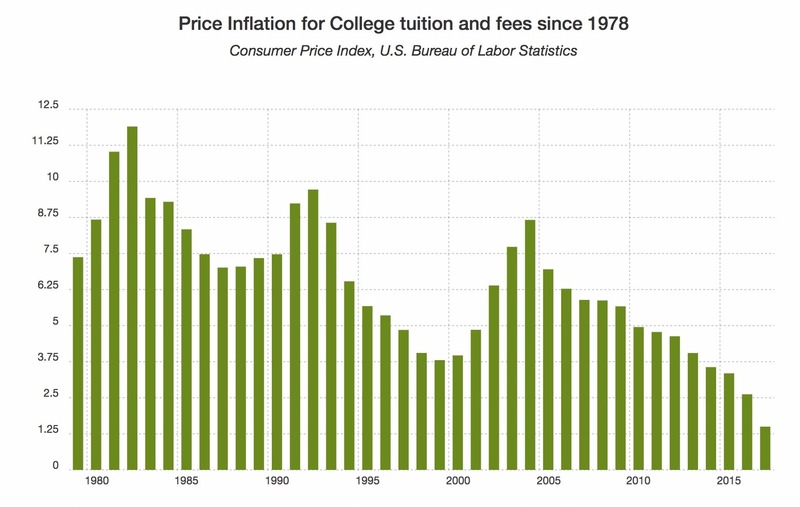 Tuition CPI was first recorded in 1978, which means that we have inflation numbers for every year since 1979. The trend over the past decade has been decreasing tuition inflation. The major years of inflation were in the late 80s and early 90s (specifically, 1981-1982, where prices rose over 10% year-over-year). It's important to consider these trends in the context of overall inflation. Price inflation is normal and it should not surprise us that tuitions are increasing with other prices. However, compared to overall inflation rate (which is only about 2.08% on average), tuition price inflation is much higher. Inflation is a "rate," which means it measures change over time. The "inflation rate" measures change in CPI over time. The Bureau of Labor Statistics collects raw CPI data. We can use this data to compute inflation. To calculate inflation between Time 1 (t1) and Time 2 (t2), you need to obtain the CPI at t1 and t2. Let's take t1=2000 and t2=2017. Using the Bureau of Labor Statistics data tools, we are able to find that the CPI at t1 was 331.800 and the CPI at t2 was 819.296. If you don't want to run all calculations yourself, just use this tuition price inflation calculator.